Dissatisfaction continues to grow with the conduct of our Council. This ad was published in the August 25, 2009 edition of The Auroran — as well a number of Letters to the Editor. It may be another year until the next election, but the campaign to replace our current Council continues to heat up. This entry was posted on August 26, 2009 at 12:25 am	and is filed under Leadership, Town Council. You can follow any responses to this entry through the RSS 2.0 feed. You can leave a response, or trackback from your own site. "Oh and why is the Mayor and council refusing to partner with "Neighborhood Network "when our friends up the road see them as a good link ." Because of Tim Jones' involvement. She won't let go of any old axe to grind. But she's concentrating on "the positives", don't you know (while we're left busy looking for them). Well I am not shocked to see it again with the mayor mugging for the camera and putting the real focus almost out of the picture . Beverley Wood is know as the heart and soul of "Welcoming Arms "so to make her the helper of the Mayor in that sad shot is predictable . The Mayor is a desperate women looking for positives and cant find a way to rally her town . If she was a real leader she would come up with her own original idea of community . Oh and why is the Mayor and council refusing to partner with "Neighborhood Network "when our friends up the road see them as a good link . The Mayor cant be original or let petty personal agendas go and that is the reason she should be really ashamed of her childish politics . Her buddy St Kitts has used volunteers from said Network ,so why isnt she off the good list ? Morris always criticized Mayor Jones for what she called " nominating his people for awards". I guess that must be OK now that she is mayor. I am sure that there are other examples that I missed. Now she is taking credit for the farmers market as per her front page picture of the banner. And I guess she has made Longo's the official free supplier of water at the market even though there are vendors trying to make a living by selling water. I thought that the market was for local farmers and vendors and not multi nationals. What next, well maybe the Brick can supply chairs and tables. But as the mayor says she is only concentrating on the positives that this council has done. WOW, that's a short list of none. Everyone should be mad – I think our taxes are outrageous but most people can't be bothered with municipal politics as evidenced by the low turnouts. We all know the GOS have been about as subtle as the proverbial turd in the punchbowl when it comes to pushing their agenda or catering to their friends but most of it is strictly amateur hour stuff and we'll probably never know how much the legal bill is/was/will be to try and keep Evelyn Buck out of the Mickey Mouse Club . Other than that the uninterested among us will shrug and say "Hey, we had a parade and a farmer's market, how bad can they be?". I'm not sayin' it's right. Dear Tim the Enchanter – you ask "so what". The so what is our tax dollars being spent inappropriatly and sooooo much time being wasted, and time is money as well. For everyone in this town that struggles to pay their taxes every year, and even if you don't struggle, the waste is outrageous! They sure as heck should be concerned ! You can try to spin all you want but facts can be painful and they carry weight, especially around election time. When it comes time to consider who to vote for lets cross reference 2006 election promises with what was delivered, and then lets cross reference the minutes with the video tapes and then let’s look at how many staff, volunteers and the elected officials or integrity commissioners have been fired or quit since the start of this term and then let’s look at how our town is perceived in the big city ! We will have to see if a picture starts to form and if so, do we want four more years of it ? Remember without Buck there you would not know what was going on in this town. Sher St.Kitts is being well compensated for her volunteering, don't you think? You would not be paying any attention to that if Evelyn did not ask one simple question. So really who is the bad guy here? Evelyn because she asks the obvious or the others who have had more closed door meetings then any other Council in history of the town. I have to ask, will the Mayor's corn roast actually make money after she pays the St. Kitts for the entertainment? Seems there have been other fund raising ventures in this town that just simply broke even after they paid for the entertainment. How much was George paid that night, we will never know. Some of the Town committees don't need to show a Finacail Statement because Evelina said so. Remember the GOS were apart of a slate. So was Gallo but he got appointed in the end. So what does that tell you about a slate in this town. Be careful what you wish for. Sign me up for the coalition. Let's get some former local politicians (if anyone can think of any) to talk about what the job requires because at this point, anyone considering running couldn't possibly have a clue with this group as a model. You know things like developing policy for the good of the ENTIRE community then allowing staff to go do their job. Sounds simple, doesn't it? Just not enough of the 30K eligible voters care one way or the other and why would they? In the small town yesteryear version of Aurora that some folks still think they live in, these "outrages" perpetrated by the current council would likely cause, well, outrage. Unfortunately, today's Aurora as "Toronto bedroom community" is the reality for (I'm guessing) most voters and their busy lives quickly turn "outrages" into trivial squabbles. Grace Marsh quit. So? The sun still came up the next day. Some blonde woman's hubby gets band gigs? Who cares? She's a good volunteer and it doesn't affect the GO train. Fired the Integrity Commissioner? So? There's more where he came from. Let's hope Buck doesn't run again. Enough is enough. It's possible for individuals to run without being part of a slate. Some complain about a slate, all the while recommending putting one together. What's the point of a slate? I've had enough too. How do I join the coalition of Aurora residents? Please if you're reading this, come out who ever you are. Can't you see you're not alone. I'm afraid the first poster to this thread is bang on. Ms. Morris is a master at marking out to the voters. She and her consorts are closely associated with the save Wells Street school crowd. From their key spokesman down, Ms. Morris is the best. The farmers market and the activities around it are another source of Ms. Morris' voter support. Couple that with all the photo ops and you have a Mayor who despite her actions and hypocracy, stands a good chance of getting re-elected. As to the poster who says he disagrees with everyone on this site and is looking to vote for a candidate without a slate, I guess to him/her Granger/Wilson/Gallo/Gaertner are not part of a slate either.So much for logical thinking. If you really want to talk about conflict ,yes St Kitts have another gig at The Mayors corn roast . But what is more disturbing ,much like Ken Whitehurst and the Cultural center fiasco is that Sher is the "Special Events Co-ordinator "and has a vote to decide on entertainment . What is really sad is there are people who have provided entertainment for free in the past for St kitts and did not even get a thank you and yet George rakes in the gigs . Also if you have noticed that rather than send people to the Town web site to promote our Town ,Ms St Kitts directs people to her personal site . Now that is really a hypocrite when she sings the praises of Aurora . The St .Kitts group is obviously in deep with Granger and The Mayor and the funds given to The Farmers Market and its executive from the Tax payer in Aurora ,well this seriously needs to be investigated as being on a committee and benefiting from it financially smacks of conflict . The Jazz festival was no joint venture ,only a promotion of a private biz (St kitts )with tax payers money . When does this sick state of affairs end …..November 2010 is not soon enough . Also the Mayor bringing in a new grocery store ,rather than ask the Market vendors is the act of a Corporate Bully supporter . That grocery store even handed out free water within the Market when vendors who pay rent sell beverages to survive . So who does the Mayor at that Grocery store Head office or as usual this is just about votes . This group makes me ill with their disrespect to the little guy . Greed ,force and bullying is all it is . I, with a group of friends who do not support the crew on this site, are looking for candidate swho are not part of a slate:the Buck politics-is-a-blood-sport group. We don't have much to say at this point but we are watching and we are concerned about what we read here. When I said "God forbid either of them runs for council in 2010" I was referring to the St. Kitts duo not McRoberts and Collins-Mrakas. Congratualtions and thanks to the group who took out the ad in the Auoran today!!!! Hopefully bringing all this "nonsense" out in the open, will encourage our citizens to take a stand against this disgusting behaviour. Don't let her continue this rein of destruction. Make the posse responsible for their actions. Stand up to this group and help us regain our dignity! The ad makes headlines in The Star this morning. The only GOS that they got a response from was Wendy Gaertner. Maybe it's her week (last week it was Granger's watch). She must have been a deer in the headlights when they spoke to her. She says she "…went into this for the right reason: to do what is right for the residents of Aurora." I guess she has no concept of what's right. Both Gaertner and Bukc said they have an idea who is behind it but would not say. Hmmmm…. who could it be? Congratulations Phyllis, your efforts to get Aurora into the headlines of the Greater Toronto section of the Toronto Star have been rewarded. Don't keep us in suspense, what's up your sleeve to make the front page, or dare I say the CBC National News? I see in the current issue of The Auroran that George St. Kitts is slated AGAIN to be the entertainment at the charity corn roast this weekend. He is the reason I will NOT be there in order to support the charity because, like the mayor herself, George (and Sher) are becoming a very tiresome act. Let's have some new talent, preferably homegrown in Aurora. It makes one wonder if there is some kind of cozy contract between Phyllis and the St. Kitts. Anyway I support the initiative to try to enlist a new crew for council in 2010. The only current two councillors I would consider throwing support behind are Collins-Mrakas and McRoberts (except Bob is a little too wishy-washy for me). I think he has integrity but he needs to be more forceful with it. God forbid that either of them runs for council in 2010.
yes, sometimes maybe even fun! of this town forward in a positive and productive atmosphere. Is this town finally getting serious about doing something about its biggest embarrassment… its town council? I sure hope so because it's about time we put a stop to this outrageous abuse of power and public funds. Well done ad… certainly to the point. Will it strike a chord with the general Aurora population however? Like Anonymous at 7:48 above says, Morris is in the paper cutting ribbons or dancing at Mardi Gras – I must admit, she does not mug for the camera like Jones used to. While this ad is good, I think that subsequnt ones should remind readers of specific things that have occured rather than general statements (i.e. the Grace Marsh Affair – sounds like a movie!). I have a concern about the wording of their purpose. To say to appeal to members of the public to run for office is a good thing. However, I can think of some people that could run that would be in the same mould (read: Walter Mastenaro (sorry if spelled wrong) or Susan Walmer) and that would not get us anywhere. I feel that this group should recruit like-minded individuals to run as a slate of candidates instead. Then this group can endorse them as being favoured by the coalition. I don't know who the coalition for a better Aurora is, but I applaud the effort. Regarding Sher St. Kitts. If memory serves – I am sure I will be corrected if wrong, you need to be a rate-payer of the municipality to run or vote in the election – own or rent a home or business location is all that is required. Was there not a former councillor who lived in Newmarket but had a business in Aurora? What if St. Kitts Music moved to Aurora? Wow I didn't think I'd see an article like that printed. It is nice to see that there are several Aurorans dissatisfied and are no collectively trying to do something productive. I'm very interested to see where this heads. I agree with Anonymous 7:48 AM, there is no doubt in my mind that Sher will move to Aurora and run for council. It would be a tough one for her to win though. No doubt about the plastic face the mayor puts on in public. Phyllis Morris brings people together. Phyllis understands partnership and inclusiveness and staying connected. Phyllis will fairly and firmly preside over town council meetings, restoring decorum to our public life. Forward thinking and tireless, Phyllis is open to ideas and brings an optimistic perspective to her work. Phyllis demonstrates professionalism through preparation, planning and perseverance to achieve desired results. Phyllis works hard and delivers. Phyllis Morris will make Aurora's concerns heard, take care of town business and represent our community’s best interests. I guess this is the tip of the iceberg when an ad like this appears. How many other Aurorans are dissatisfied with this council? Do people really care or will they go to the polls in November 2010 and forget about the past? I think that folks really do not care what happens other than a handfull who write the papers and take out ads like this. Even if the ad runs every week, people on the streets of Aurora really think that this mayor and her merry bunch of followers are doing a good job. The mayor continues to fake it in public and shake hands and even walk ugly dogs at the Town park to get attention. She and St Kitts seem to have a bond that they share regardless if the ship is sinking. 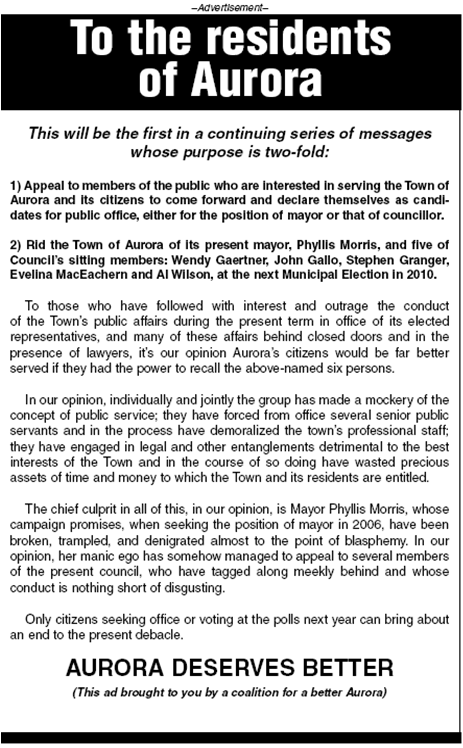 Perhaps St Kitts will move to Aurora after reading her letter in the Auroran this week so that she can run for council and be another uninformed follower as are the group of 5 presently on council. People in Aurora will forget or not care and they will re-elect this poor excuse for a mayor and council.